Overview: This UK-based FCA and FSA-regulated brokerage firm based in the Republic of Seychelles offers trading to institutions and retail clients globally. Its forex business offers gold and silver as well as 62 currency pairs (including cryptocurrency) for trading. The broker have a lower minimum deposit compared to some of the other brokers on this list. It is a great broker firm for beginners to try their hand. Accounts: Tickmill offers various types of accounts for various trader profiles. Commission-free classic accounts for beginners, pro accounts, VIP accounts for those who trade a lot and want special service, and Islamic accounts. Traders will be thrilled to find the demo account offers MetaTrader 4 for testing, and includes real-time prices and volatility. Minimum deposit: $25 in Classic and Pro accounts, 50,000 minimum balance in VIP accounts. 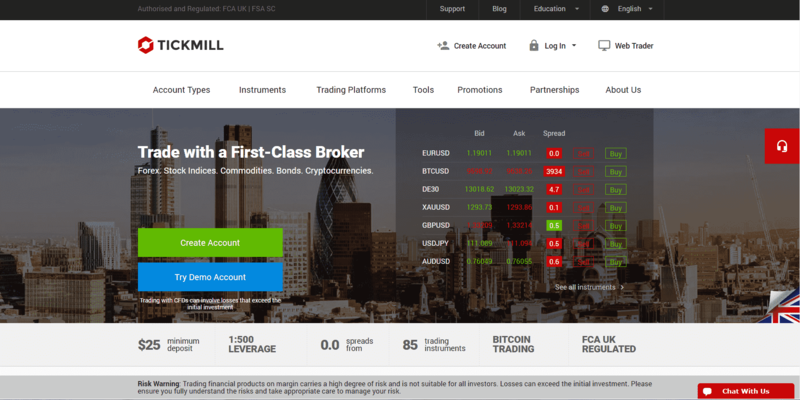 Features: Tickmill offers two platforms to trade on. MetaTrader 4 is the main platform. For those who want to trade quickly through their browsers without downloading any software, there is the Web Trader. Tickmill also offers a variety of tools including forex margin and currency calculators, autochartist for technical analysis, forex calendar, and Myfxbook autotrade. The Tickmill VPS keeps the MT4 EAs and signals running when the customer is offline. One-Click Trading option enables quicker real-time trading. Promotions like the Introducing Broker service allows traders to earn commissions on reference. A Multi Account Manager is also available. Education: Webinars and video tutorials are available. Deposits/Withdrawals: Several funding options are available to customers, and withdrawals are processed within one working day. Customer service: 24/7 via online chat or email, and support lines on weekdays. Yes. TIckmilll is regulated under 2 different regulator bodies to offer different options for its clients. Tickmill is regulated under the FCA and FSA of Seychelles. Tickmill Bonus – Do they offer any ? Tickmill offers a $30 Welcome bonus where a $30 tradable amount is added to your account. Is Tickmill an ECN Broker ? Tickmill falls under the NON Dealing desk Market Maker broker type. They are not a True ECN Broker. Tickmill Canada – Do they accept Canadian clients ? Yes. Tickmill does accept residents of Canada. User reviews: Check out more TickMill Reviews below.